This was a must win game for Annan if they were to have any hope of staying in contention with the teams in the play off zone and for a long period in this game it looked as if neither team would produce the sparkle to win the match with both teams defending exceptionally well to nullify their opposing attacks. It was however Annan who eventually won the match courtesy of 2 magical goals scored in the last six minutes by substitutes Scott Roberts and Conor O’Keefe. Annan had Alex Mitchell to thank as well as the late goals. Annan boss Peter Murphy elected to go with the same team which picked up a valuable point in the three all mid week draw against Peterhead and with Steven Swinglehurst still out injured there were no changes to the substitutes bench. The first half was fairly uninspiring with goal scoring opportunities at a premium but it was the visitors who started the most promisingly with Cook and Paton in particular looking a handfull for the Annan defence. Stenhousemuir won a free kick in the 20th minute ending with Mark McGuigans shot being deflected for a corner kick. This was followed by a Mark Ferry effort as the visitors went all out to break the deadlock. As the game approached the half hour mark Alan Cook was presented an opportunity from a free kick 28 yards out but the shot was wild never troubling Mitchell. Annan were rarely seen as an attacking force up to this point but in the 35th minute they were denied when Aiden Smith was put through one on one but the game was pulled back and a free kick awarded to Annan which denied Annan a promising situation. As the game approached half time on loan Hearts striker Harry Paton came very close with a low raking shot which went narrowly past the post. Stenhousemuir were first on the attack in the second half when Eddie Ferns effort was blocked this was followed by an excellent save from Lewis McMinn who denied Aidan Smith after the Annan striker latched on to a Blair Henderson pass to finish with a low shot. Alex Mitchell then pulled off a stunning save when he somehow tipped Nikki Paterson’s net bound shot on to the underside of the bar. Almost immediately Annan broke to the other end and Blair Henderson won a free kick on the edge of the but disappointingly Ryan Sinnamon’s free failed to hit the target. The introduction of Ben Armour in the 69th minute was a turning point from the home team and the on loan Morton striker came close with a shot which went narrowly over the bar in the 75th minute. 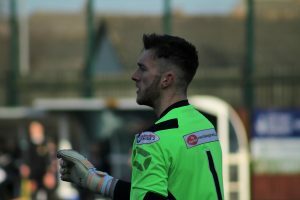 The match was very much in the balance and in the 77th minute Annan once gain had goalkeeper Alex Mitchell to thank when he pulled off a point blank save to deny Mark McGuigan who’s shot from 8 yards through a ruck of players looked net bound until Mitchell saved the effort. The Annan keeper then denied McGuigan at the near post. Annan made the breakthrough in the 84th minute, Rabin Omar finished a good move down the right when he picked out substitute Scott Roberts who chested the cross ball down to finish with a stunning low shot into the corner of the net. Stenhousemuir almost replied immediately when their man of the match Harry Paton finished a great penetrating run with a left footed shot which went narrowly past the post. Annan had the final say and it was another stunning goal created by Blair Henderson who set up substitute Connor O’Keefe who finished with a spectacular shot from 22 yards which ripped into the top corner of the net to secure a victory for Annan which keeps them on the fringes of the play off zone as they enter the last quarter if the season. Montrose lost their slight advantage at the top of the table as Berwick pegged them back twice to earn a 2 -2 draw. Peterhead took advantage with a 2 goal victory over bottom club Cowdenbeath . Edinburgh City lifted 3 precious points with a convincing 4 goal victory over Elgin City . Stirling Albion defeated Clyde 2-1 to bring to an end Clyde’s 5 win run. Annans next fixture is away to Montrose next Saturday.